Holistic Bio Spa is honored to re-introduce our beloved Jaqui Karr. A successful certified nutritionist and vegan/vegetarian dietitian. She will be explaining everything you need to know about the SCIO Quantum Biofeedback. We are all your’s Jaqui. We’ve become desensitized to the expression “life’s too short”, but it really, really is too short. I made a decision years ago to never let an opportunity to live a richer happier life escape me. So when I find a shortcut, I take it. 8 days a week, I take it. It’s one of the smartest conscious decisions I ever made. Let me back up a second, so you know where I’m coming from. When it comes to my health, I’m a science girl. I don’t like hocus pocus (isn’t that why Las Vegas was invented? ); I don’t like a gypsy with a turban on their head telling me the spirit of my great-aunt from 1871 suggests I eat more broccoli. I like facts. Call me a nerd. However, I keep an open mind to alternative health and solutions that the standard laboratories don’t accept (their loss, it doesn’t have to be yours). When a 12 time Nobel Prize nominee invents something, I’m all ears. I mean, how much more scientific does it get than t-w-e-l-v-e Nobel Prize nominations?! Welcome to the world of SCIO Quantum Biofeedback. I know what you’re thinking: “Quantum-what? This sounds like a good time for a margarita”. Hang in there, I’m about to tell you how to re-negotiate the DNA you inherited. First of all, you heard right: change you at your core. What you’re born with and what you have become due to life’s scars don’t need to stay with you. Chronic physical or emotional pain doesn’t need to stay with you. They can stay with you forever if you choose. Or you can choose to live a better life – faster, easier, and without spending 40 years reading 500 self-help books (I’ve read them, I’d rather be beachcombing). The SCIO Quantum Biofeedback is advanced science that erases all the blockages keeping you from living the life you want to live. We get hit with 1001 things from dysfunctional families to crazy bosses to heartbreak, and after a while, it’s like this huge climb up the mountain alone. You know what, when someone offers you a helicopter ride to the top and a big fat “delete button” to get rid of life’s bad stuff, take it. Take the shortcut. This process helps you with all the stuff you never thought you could change, like negative thinking, stress, physical stresses that normal detoxes don’t seem to be working on,…you will be amazed at the things it targets. I was completely shocked when I saw the list of things that came up on the screen because I had told Zoli absolutely nothing about emotions! I told him I felt tired, my trip to Vallarta was a little taxing on me, and I’ve been detoxing and healing from a recent painful gluten contamination. That’s all I said: tired and gut detox. Within minutes I saw lifelong issues I’ve been struggling with appearing on screen, and within an hour I felt all anxiety gone from my body and mind. I’m writing this article 2 days later, and that Zen feeling is still with me. Words can’t describe it; you have to feel it for yourself. How does the SCIO Quantum Biofeedback work? Quantum science is actually more complicated than rocket science, so I won’t fry your brain (or mine) getting too technical. Rocket science is just about how to get from here to the moon without getting scorched. This is a whole lot more complicated and genius than getting to the moon. This machine “reads you” through electrodes and targets all your weak points. Then it neutralizes them. It’s pulling info from your bio-energy and then re-calibrating you with thousands of energy frequencies per second. Your body reacts to those frequencies, it reads you again, then sends thousands more, e-v-e-r-y second! Multiply that by an hour (somebody please call Einstein to do that calculation). I’m telling you, it’s more genius than rocket science. A: No! It’s the most relaxing experience you’ll ever have,and I promise you’re not going to want to get off that amethyst chair. A: Not all clinics have it, God bless Holistic Bio-Spa, they do. Amethyst absorbs negative energies and relaxes you at levels that would take 10 years of meditations with a monk. Amethyst chair. You’re going to love it (I’ve been trying to bribe the night security staff into letting me sleep on it overnight, so far: nada). A: Yes! A stress-free you! I’m an amateur on this topic (who got blown away by the experience). I suggest you call Zoli Hargitai, a 15 year expert with SCIO Quantum Biofeedback in Puerto Vallarta. Prepare to say goodbye to all the stress and pains that you thought you were stuck with. At the Holistic Bio Spa, we are a team of medical professionals experienced in helping people heal in their own terms. The SCIO Quantum Biofeedback reveals the emotional, pathogenic, and energetic root causes of physical conditions while preventing future risks. Holistic Bio Spa is located in Plaza Marina, Local B-10 of Puerto Vallarta. Open Monday to Friday from 9 AM to 6 PM, Saturdays from 9 AM to 2 PM. 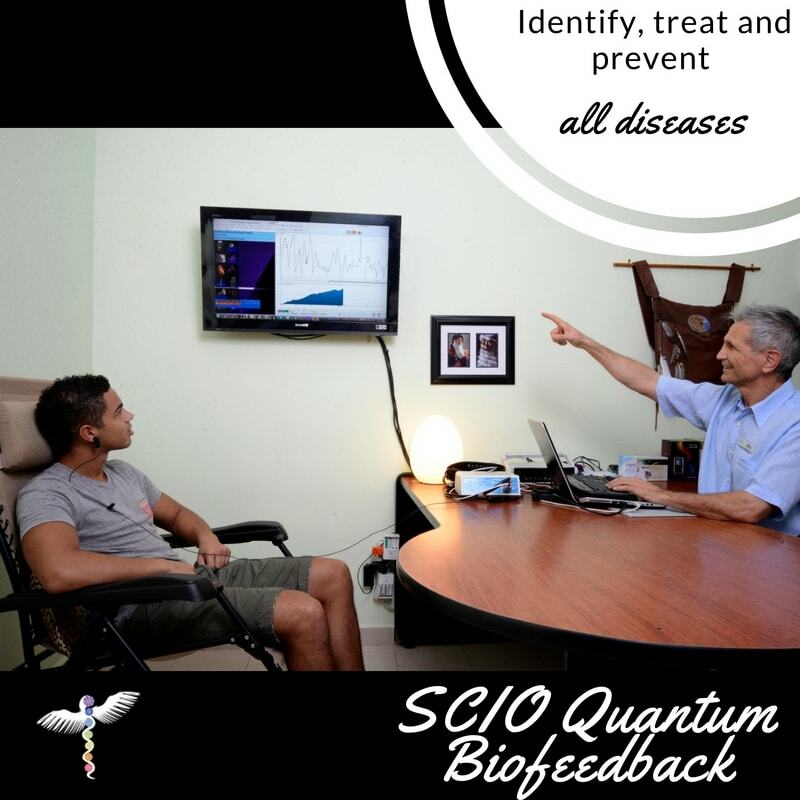 Give us a call at +52 322 221-1607 to schedule your naturopathic health consultation with the SCIO Quantum Biofeedback. Do you have any questions about how the SCIO Quantum Biofeedback can help you renegotiate your health? Let us know in the comments! 3 Responses to "SCIO Quantum Biofeedback: De-Stresses Effortlessly and Naturally"
Thank you so much for the great article/info. I am still Here at Holsitic Bio Spa doing SCIO every day on the Amethyst Christal mat. Where is Zoli & the SCIO & The amethyst chair? I noticed I no longer needed it & it had zero hold on me.. which is impossible any other way. That as I said was 20 yrs prior never needed or took it again. Learned from The Best of the Best who gleaned the same in his life & as he said we learned from each other. It could be noticing a tree a breeze felt a new painting in the sky whatever brings peace at that moment & brings one back to the Present. I went to the perfect gift of a physical therapist & beyond originally from Holland her family now living in Switzerland learned from the Best. One move in particular she showed me to do so it would never happen again. I feel asleep every time at the end. The SCIO in the right hands is priceless faster than lighting mulitiple things ( issues) can be piggybacked rectifying ( clearing all at once & much more in billionths of a second. What was just written by the gentleman?